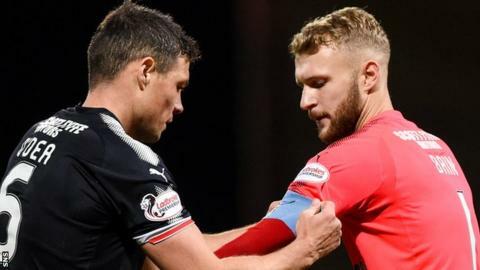 Dundee manager Neil McCann has refused to be drawn on the future of Scott Bain after the arrival of fellow goalkeeper Jeremy Malherbe on trial. Bain has been absent for two games since a disagreement with McCann, who now says the 25-year-old will also miss out against Rangers through injury. "There's an issue there with Scott where he finds himself out of the side and he's now injured," was all McCann would say ahead of Friday's fixture. "The situation is still ongoing." Bain, who followed previous manager Paul Hartley to Dens Park from Alloa Athletic in 2014, is in the final year of his contract and in September said he did not have any plans for talks about a new deal. But the goalkeeper, who has featured in Scotland squads without winning a cap, had been an ever-present under McCann until a 3-1 defeat by Hamilton Academical on 28 October. Elliot Parish, the 27-year-old who arrived from Accrington Stanley in July, was preferred against Hibernian and Kilmarnock, with 19-year-old Calum Ferie on the bench, and now Dundee have given a chance for Frenchman Malherbe to impress on trial. The 26-year-old, who had spells with Nancy, Grenoble, Gap Hautes Alpes, Reims and Roeselare, is a free agent after leaving Dinamo Brest this month. Malherbe played 22 times this year, including Europa League qualifiers, for the side who sit fourth in the Belarusian Premier League with one game left of their season. On the suggestion that Malherbe, who had not featured for Dinamo since September, is at the Scottish Premiership club to replace Bain, McCann said: "That's the outside perspective. "We had the opportunity to bring Jeremy in and he's been really impressive. "We've only had a short time to work with him, but he's looked good and is not attached to a club at the moment, so it would be remiss not to take him on and he's fared well." On the subject of the disciplinary case involving Bain, McCann insisted that he is happy to deal with big personalities in the dressing-room and claims it is important to the development of any team. "I have lots of strong characters in that dressing-room," he added. "I like players to be vocal and ask questions. "I'm not frightened or shy in coming forwards to deal with big characters. "Without big characters and leaders in the dressing-room, you're never going to be a successful team and we have a number of them."